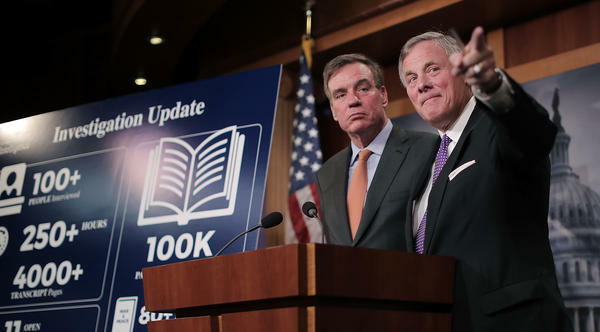 Senate Intelligence Committee Chairman Richard Burr, R-N.C. (right), and committee Vice Chairman Mark Warner, D-Va., hold a news conference Wednesday on the status of the committee's inquiry into Russian interference in the 2016 presidential election. The question remains "open" as to whether any Americans colluded with the Russian influencemongers who interfered with the 2016 presidential election, the chairman of the Senate Intelligence Committee said Wednesday. North Carolina Republican Sen. Richard Burr said that after 250 hours' worth of interviews and 100,000 documents — including campaign materials and highly secret intelligence reports — the Intelligence Committee doesn't have an interim conclusion. It needs to absorb all the material it has collected and continue with still more interviews, he said, including some 25 scheduled for this month. 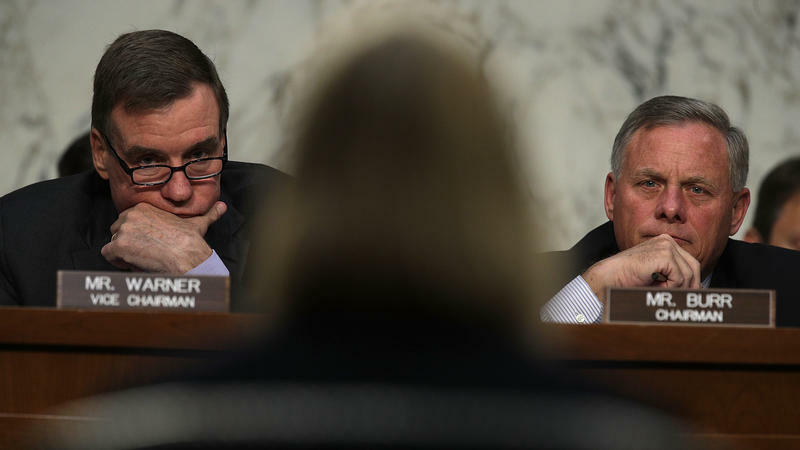 "Let us go through that process," Burr said. He told reporters on Capitol Hill that he still hoped to issue some kind of public report about what intelligence professionals call the Russian "active measures" aimed at the U.S. and the West, but Burr declined to set a date. Maybe it could be this year, but at the latest Burr said he wants it to appear before next year's congressional midterm elections. The magnitude of the work still ahead of the Intelligence Committee was underscored by the number of interviews scheduled for this month and the volume of material it wants from three big online platforms: Google, Facebook and Twitter. 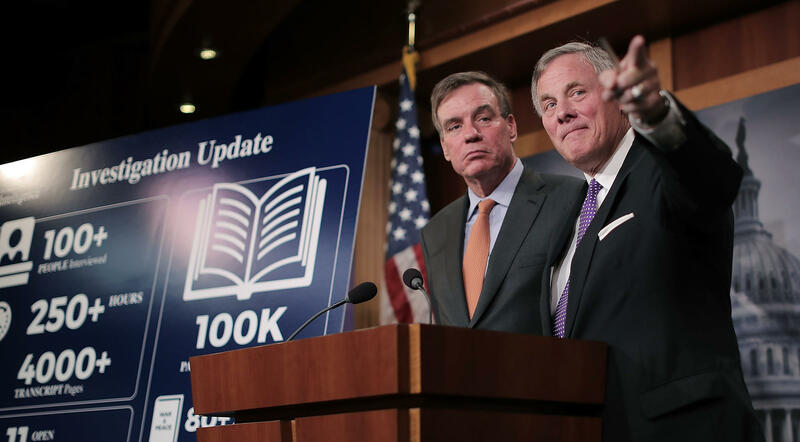 Burr and the committee's top Democrat, Virginia Sen. Mark Warner, have lately focused on the overt use of these networks by Russian influence operators. It appears to have taken place at the same time Russia's GRU spy service and others were using covert techniques, including cyberattacks to steal information or probe state election systems. Russians or their operatives were buying public ads aimed at amplifying political division in the U.S., or using fake accounts, disguised as Americans, to openly throw fuel on hot controversies. Facebook surrendered the content of thousands of ads to Congress this week and it has acknowledged that some 10 million Americans may have seen them from 2015 to earlier this year. Burr and Warner want to know more about what the online companies know about these operations and have convened an open hearing with them on Nov. 1. Facebook and Twitter said on Wednesday they'll send representatives to appear, Recode reported. Google did not make any commitment. The simple quantity of investigation that still must be done — at this hearing and through the committee's other efforts — suggests that the Senate committee's work may carry on for several more months. At least some avenues, however, are closing — Burr said the committee has "hit a wall" as it tries to find out more about the infamous, unverified dossier on President Trump that exploded onto the scene earlier this year. Only an interview with the former British intelligence officer who produced it, Christopher Steele, could help move things forward, Burr said, but Steele has not agreed to talk. The Intelligence Committee also has "reached a logical end" to its pursuit of information about Trump's firing of FBI Director James Comey. Burr said investigators have talked with everyone they wanted to get information about the Russian interference aspects of the matter, but he is now referring questions about it to Justice Department special counsel Robert Mueller. Mueller is believed to be investigating whether Trump's decision to fire Comey — which, among other reasons, the president has attributed to the Russia investigation — might have amounted to obstruction of justice. Burr and Warner are keeping their committee clear of that question, and another panel, the Judiciary Committee, has locked horns with the Justice Department about getting witnesses for its own inquiry. As to the broadest question about whether Russia did, in fact, launch an influence campaign, that was never in dispute for Burr and Warner. Trump, however, goes back and forth about how he describes the matter; he has both accepted that it happened and called it, most recently, a "hoax." Burr said he would not be drawn into responding directly to the president on that point, but he did reaffirm that he had no doubt that Russia's "active measures" campaign had taken place last year and continues, in different form, to target the West. "You can't walk away from this and believe Russia's not currently active in trying to create chaos in our election process," Burr said. "The overall theme of the Russian involvement was to create chaos at every level." 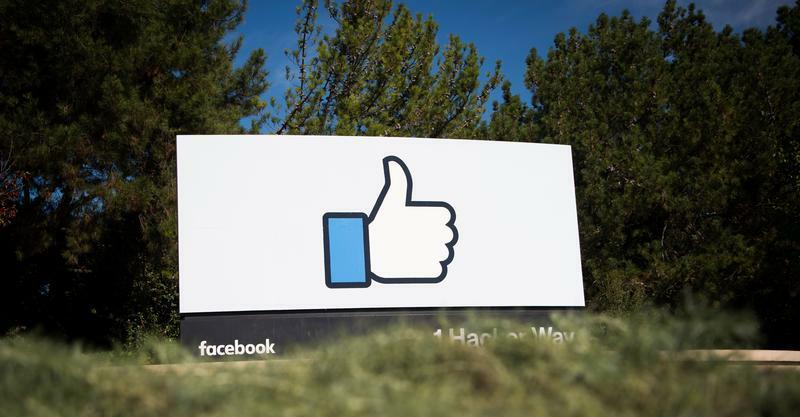 Facebook said on Monday it has given Congress thousands of ads linked with Russian influence operations in the United States and is tightening its policies to make such interference more difficult. "Many [of the ads] appear to amplify racial and social divisions," it said. 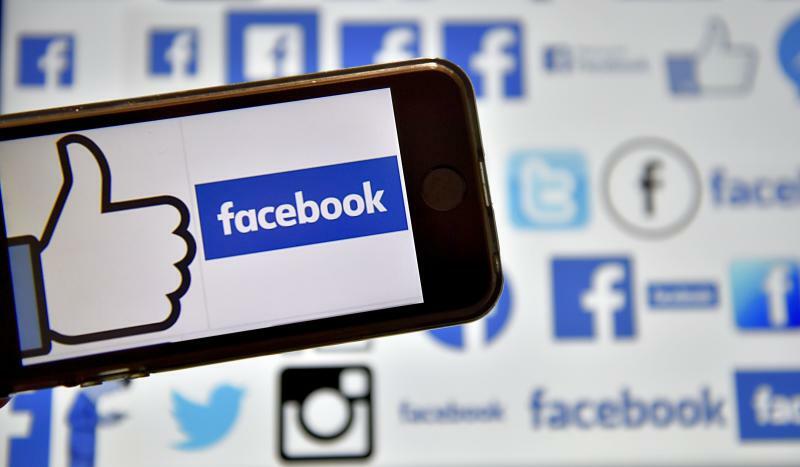 The social media giant confirmed that it discovered the ad sales earlier this year and gave copies to Justice Department special counsel Robert Mueller, who is investigating Russian interference in the 2016 election. Last week in the Russia investigations: Washington gears up for the leaders of the Senate Intelligence Committee, Twitter gets its turn in the barrel and states learn at last about the extent of last year's attack. Before we take a look back at the past week in the Russia imbroglio, a look ahead: The chairman and vice chairman of the Senate Intelligence Committee have scheduled a press conference for Wednesday. 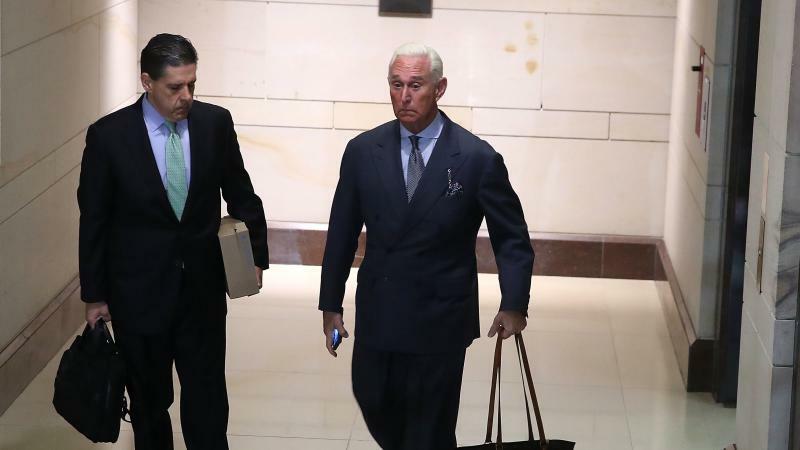 Roger Stone, the longtime ally of President Trump's known for his brash and braggadocio style, answered questions behind closed doors from lawmakers and staff for the House Intelligence Committee for more than three hours Tuesday, as part of the panel's ongoing investigation into Russia's interference in the 2016 election. For more than nine months, Twitter and Facebook have tried to dodge the intense public scrutiny involved with the investigation into Russian interference in last year's presidential election. Now they're in the spotlight. Congressional investigators are digging in on Russia's use of Facebook, Twitter and other social media companies to try to influence the 2016 campaign. Facebook's concession that it sold $100,000 in ads to Russian-linked accounts last year may be "just the tip of the iceberg" of how social networks were used to interfere in the election, warned the top Democrat on the Senate Intelligence Committee. 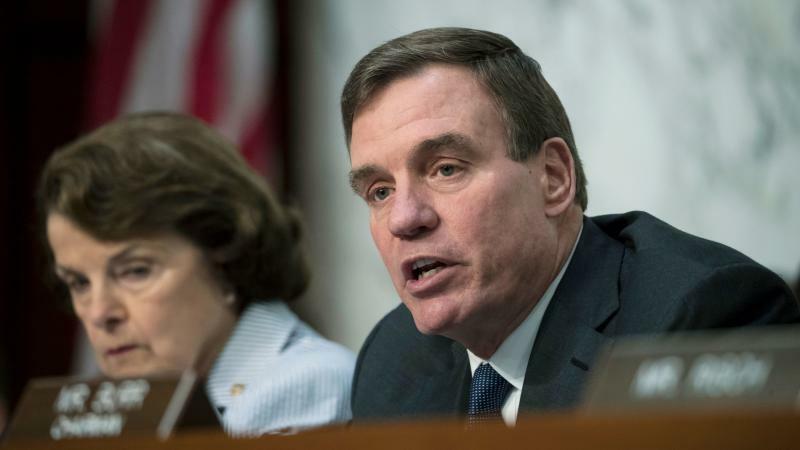 Virginia Sen. Mark Warner, who is leading the Senate's investigation into Russia's election attack, said Thursday he has long believed that Moscow used overt social media sites like Facebook and Twitter to intervene in the 2016 election, as well as other covert tools such as cyberattacks.